So far in this series, we’ve looked at the Line Tools, the Shape Tools and the Pencil and Smooth Tools. Today we’re looking at one of the most important, and most frustrating tools for “newbies” – the Pen. I’ve been teaching both Photoshop and Illustrator for several years now, and without doubt, the Pen tool is probably the most feared and avoided tool in both programs. But with a bit of practice and perseverance, you’ll find that the ability to use the Pen tool really opens up a whole new world for you, and will become second nature to you very quickly. So let’s get started with using the tool to draw straight lines. When you are drawing with the pen tool, you are placing anchor points on the artboard. The anchor points are joined by a path, forming a line segment, which can be a straight line or a curved line. You can draw straight line open paths, or closed paths. 1. Select the Pen tool from the toolbox or hit P as a shortcut. When you first select the pen tool, a small x will appear beside the cursor, indicating that you are about to start a new path. 2. Click once on the artboard where you want the straight line segment to begin. Do not drag. If direction lines appear (they look like extra lines coming out of an anchor point), you’ve accidentally dragged the Pen tool; choose Ctrl + Z (windows) or Cmd + Z (Mac) to undo, and click again. 3. Click again where you want to add the next anchor point. Shift-click to constrain the angle of the segment to a multiple of 45°. 4. Continue clicking to set anchor points for additional straight segments. The last point you add will always appears as a solid square, meaning that it is selected. The other anchor points you’ve added will appear hollow. If you want a closed path, position the Pen tool over the first anchor point you put on the artboard. A small circle appears next to the Pen tool pointer indicating that the path will close correctly. Click to close the path. If you want to leave the path open, simply, Ctrl + click (Windows) or Cmd + Click (Mac) anywhere away from all objects. You’ll notice that the Pen cursor displays the small x again, meaning that the next time you click with the Pen tool you will be starting another new path. Alternatively, you can close a path by clicking on any other tool in the toolbox. There will, of course, be times when you want to add extra anchor points to your lines, or delete anchor points that you don’t need. Remember, a good rule of thumb is to use as few anchor points as possible to achieve smooth lines. 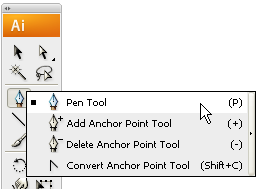 The Tools panel contains three tools for adding or deleting points: the Pen tool , the Add Anchor Point tool , and the Delete Anchor Point tool . Let’s say I want to remove a point from the path I drew earlier. Select the Delete Anchor Point tool from the toolbox or press the minus sign (-) on the keyboard. Then click on the point you want to delete. You can see that the shape of the line has now changed. If you want to add an extra anchor point, click anywhere along a line segment using the Add Anchor Point tool. So that’s how to draw straight line segments, pretty easy and nothing to be scared of there! It’s important to also mention the Selection tools which allow you to edit the paths that you’ve drawn. To move an anchor point, click on the point with the Direct Selection tool (press A for shortcut)to select it. Shift+click to select multiple points. Once you have selected one (or more) points you can then drag that particular point. To select all anchor points and the line segments between them, click anywhere on the path with the Selection tool (V). Now when you drag, the entire path will move. Ok, so we’ve looked at drawing straight lines with the Pen and also how to select individual points or the entire path using the Direct Selection and Selection tools. My advice would be to practice making shapes and drawing open and closed paths with the Pen till you feel really comfortable with it. In the final part of this Illustrator series, I’ll show you how to make curves and combine them with straight segments. Once you have that under your belt you can pretty much draw anything with the Pen.